Due to the bad weather in Germany the 8th Air Force was given targets in France. 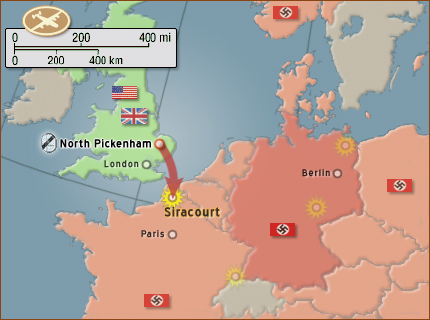 The 2nd Air Division was assigned to take out V-weapon sites around Siracourt that had been terrorizing the British civilians. Missions on V-1 rocket bomb sites were called "NoBall" missions by the veterans who flew them. Officially they were CROSSBOW missions since they were sorties flown for OPERATION CROSSBOW, an ongoing operation to destroy Hitler's Vengence-Weapons. The Crossbow sites were well camouflaged, so bombing would need to be directed by PathFinders. The 492nd participated in the Siracourt raid dispatching 24 of its ships to be led by a PathFinder from the 44th BG. During assembly the planes flown by Hadden 608 and Menweg 908 had to abort. Although the fighter protection was strong, the short mission really didn't need much escorting, as there were very few enemy fighters left stationed in France to protect the coast. On that day the Luftwaffe didn't even bother to come up and challenge the 8th Air Force. Flak was fairly light over the coast as well as the target, much like with the previous missions. However, the Group got a new experience by seeing ground rockets fired at them. Fortunately none of them found a ship. We haven't seen anything that says how effective the mission was. The clouds were thick and visibilty was poor. The PathFinder marked the spot according to their information and the bombers hit it. For reasons unknown, 3 of the credited sorties weren't able to bomb their target. On the return as the Group flew over Ostend they discovered that even a little flak can be lethal. The stories told are varied except for the fact that Lt Sonner, the co-pilot for the Miller Crew 810, was killed by flak. The official report says that he was killed by flak exploding near the nose. Other accounts claim that the flak shell went clean through the ship taking out the co-pilot in the process. The Group suffered its first casualty by enemy fire. The news of Lt Sonner's death went around North Pickenham quickly. The inclement weather gave the Air Force the next three days off, giving each man time to dwell on his potential fate. As some old soldiers had put it, "there comes a point when a man can get so scared he's not scared anymore." The men knew why they were there. They understood the importance of liberating Europe. They knew that their lives were nothing compared to that of the world's. One by one they began accepting their fate, come what may. In a sense, they made their peace with God and left their fates in His hands. Of course, no one wanted to die and each man would try his best to keep from getting killed. One by one they quit "being scared of dying" but retained their fear of "getting killed." The difference is they didn't worry about getting killed until someone was actually trying to kill them.